Through the years, the Titans have had team ups with their mentors in the Justice League…and usually the meeting involves a lot of condescension and doubt from the League. 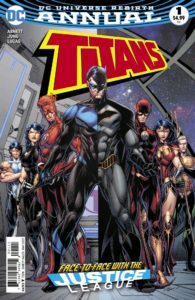 Still, this is a much more mature Titans team, so they should get all the…well, at least ONE member of the League gives some proper respect from the beginning, in a story that was entertaining for now and that may have clues to future stories for the whole DCU. Want to know more? Follow us ater the jump! We start in a remote location, as members of the Titans disappear from their normal places and meet up in a sort of locked-room mystery. As they begin to show up, so do their mentors. Of course, not only do the Justice Leaguers not trust the Titans to lead…they don’t even trust that they even are who they say they are! Well, that’s with one exception. FINALLY, someone refers to Wally as Flash…and it couldn’t have come from a better person than Barry himself! Now, to be fair to the rest of the Justice League mentors, there is a reason for them to be a little paranoid. This has been set up to mentally test all of them. The villain known as The Key has gathered them together for the purpose of breaking each of them mentally, to use that mental energy to free…someone…to enter this reality from a multidimensional holding area of some sort. Just who this is…we won’t learn in this issue, but you can count on it having a serious impact in future issues of TITANS…and possibly across the DCU. This Annual has a lot of fun with “who is the leader of the group”, bouncing that around a lot of characters. But, it also highlights the biggest difference between the League and the Titans…the true friendship of the Titans, their love and care for each other, is frankly a lot stronger than the League has ever had (or may ever have). Maybe it comes from essentially growing up together, but this group is exceptionally tight, and this annual shows it. Now, there is one BIG plot point involving one of the Titans, but I’ll leave that to you to read. It isn’t a complete surprise to readers of a certain other title, but it will have some reverberations here in TITANS as we move forward. SUMMARY: THIS is what an annual should be. We get a story worthy of the page count, one that can stand on its own but also feeds right back into the continuity as the regular issue count resumes. The “guest stars” have a good reason to be there, and their presence in no way diminishes the starts of the title. The pacing was perfect, and the ending leaves us waiting for the next regular issue to see what happens next. The artwork by Minkyu Jung (wih colors by Adriano Lucas) are exceptional. This was a perfect annual for me…worthy of a 10/10. That’s my opinion – what do YOU think? Leave your comments below! This entry was posted in Reviews and tagged Annual, Barry Allen, Justice League, Review, Titans, Wally West on April 1, 2017 by Ed Garrett.